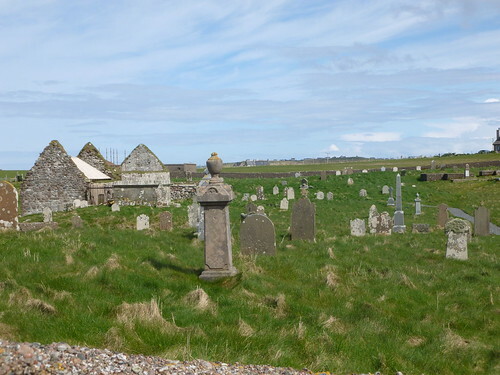 This is the sight that one meets upon approaching the Aignish cemetery here in Lewis, some 3 miles east of Stornoway. It is not possible to visit the cemetery at all, due to refurbishment works on the old Eye Church, on the left of this pic. 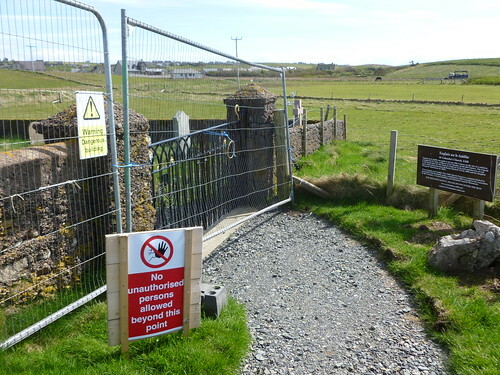 When I complained, the Eye Trust, which has commissioned the works, told me: "the contractors insisted on isolating the whole cemetery during the consolidation works, for health and safety reasons, as well as security". Is it permissible to close access to a cemetery, on account of work being carried out on one edifice within it? What if anyone wants to visit an ancestor's grave? The works are due to finish in 2013/14. I'd have just climbed the wall, I doubt you'd have been seen! What a load of nonsense shutting the whole cemetery off. The cemetery is now open as usual, following the completion of work on church and burialground.